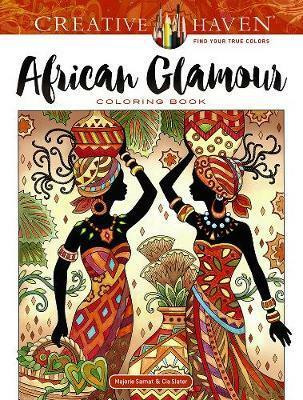 Bestselling coloring book artist Marjorie Sarnat has teamed with fashion designer Cia Slater to create this gorgeous collection of 31 classic African-inspired images. Striking silhouetted figures wear beautiful head wraps and flowing gowns decorated with patterns based on traditional African arts and crafts designs. Background elements include animals, plants, and fanciful ornaments. Pages are perforated and printed on one side only for easy removal and display. Specially designed for experienced colorists, African Glamour and other Creative Haven(R) adult coloring books offer an escape to a world of inspiration and artistic fulfillment. Each title is also an effective and fun-filled way to relax and reduce stress. Cia Slater is a professional artist and fashion designer with a deep understanding of African design and traditions. She has worked at the famous Crystal Cathedral's Freed Theater in Los Angeles, designing costumes for many of their productions. Her professional design experience also includes award-winning runway fashions, wedding gowns, and fashion illustrations.